Mike Sainristil (5) was a game-breaker for the Everett High football team the past two seasons. 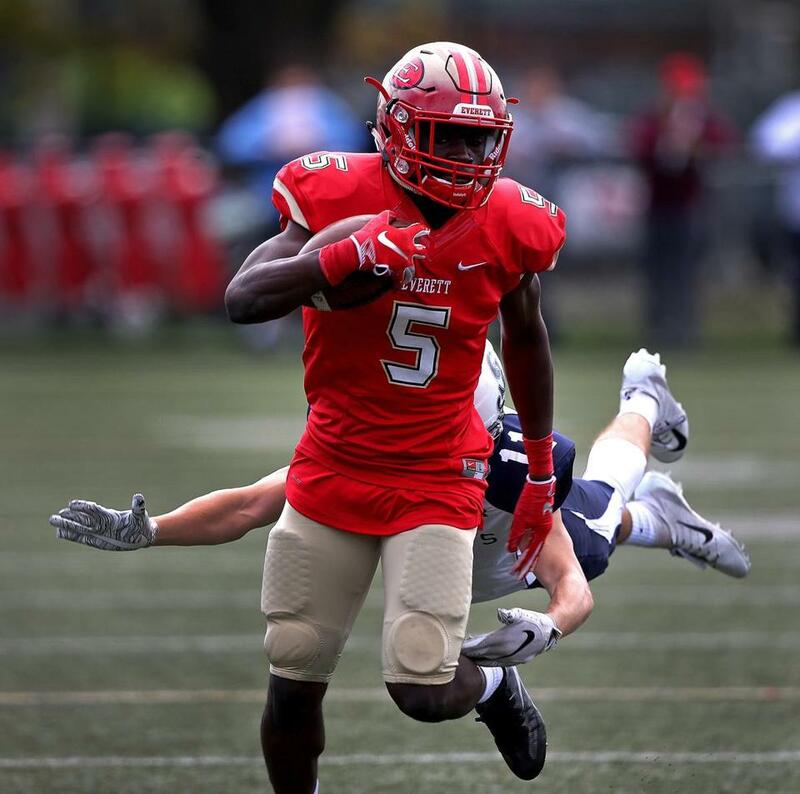 Everett High senior Mike Sainristil, the state’s most dynamic three-phase threat, has been named 2018-19 Gatorade Massachusetts Football Player of the Year. The sixth player from Everett High to receive the award since its inception in 1985, the University of Michigan recruit helped the Crimson Tide to consecutive Division 1 state titles in 2016-17 and a 27-game winning streak that ended in a D1 North sectional semifinal loss to Central Catholic in November. The 5-foot-10-inch, 175-pound wide receiver, defensive back and punt returner caught 30 passes for 762 yards and 12 touchdowns this season, finishing his career with 28 receiving touchdowns. Sainristil also has tallied 10 interceptions the past two seasons, recording three in a win over Mansfield this September. “We basically double-covered [Sainrsitil] the entire game to reduce his impact, and the two times we didn’t double him he had two touchdowns,” Mansfield coach Mike Redding said. Sainristil has maintained a B average in the classroom and his financial aid agreement with Michigan allows him to immediately enroll and attend collegiate classes for the spring semester. A member of the Haitian Club at Everett, Sainristil also plays the violin, piano, and drums. He volunteered locally as a youth football coach and took part in multiple community service initiatives through his church. Sainristil will have the opportunity to award a $1,000 grant to a local or national youth sports organization of his choosing, and is eligible to submit an essay to win one of 12 $10,000 spotlight grants available to honorees from each state for the organization of his choice.